“Racism, imperialism, contradictions,” the organizer read off of pieces of poster paper to a workshop full of people. The room slowly became quieter until everyone was completely silent, contemplating each word as the list continued on. The workshop called “Raced in America: White Culture, Privilege and Bias” was hosted by Santa Cruz County Community Coalition to Overcome Racism (SCCCCOR) on April 15. Its purpose was to engage participants in activities that varied from defining American identity to locating structural racism in a U.S. history timeline. “We want to enlighten, […] bring on a sort of awareness and consciousness of the inner and outer division of humankind,” said SCCCCOR member and UC Santa Cruz alumna Lakia “Kia” Queen. About 40 people, mostly white and over the age of 50, attended the event at the Resource Center for Nonviolence to share personal experiences and learn about systemic racism and privilege. “We live in a system we can’t see, it’s just there. It’s the water I’m swimming in, and I don’t see the water. I have to actively do something about it to wake up,” said SCCCCOR member Leslie Potenzo, who is white. Potenzo emphasized the importance of being aware of the systems that affect our everyday lives — and how the effects of these systems vary from person to person. The first step to becoming more aware of these systems, she said, is taking workshops like this. SCCCCOR, a local grassroots group that helps the community better understand racism and its effects, works in collaboration with World Trust, an organization that provides resources for learning about racial inequity, according to its website. The workshop started with each participant sharing five words related to American identity. Afterward, participants thought of a word related to their more personal identity. Words like “conflicted” and “shame” from the first activity were contrasted with more positive and personal words like “compassionate” and “queer” from the second activity. Other activities throughout the day included an interactive timeline and sharing of statistics and video clips to show how racism affects people’s lives, especially in areas like wages and healthcare. The day concluded with the showing of a TED Talk by Chimamanda Ngozi Adichie. Adichie uses her account as a Nigerian writer to emphasize the destructive consequences of the “single story.” The “single story” is created when someone only hears one perspective and doesn’t take any others into account, resulting in stereotypes. “Read fiction and nonfiction written by people that are of a different cultural background for a different point of view or a different cultural experience or different race experience,” Potenzo said. Participant Sarah Carvill, an environmental studies lecturer at UCSC, related the ideas from the workshop to her personal experience as a former student at UCSC. 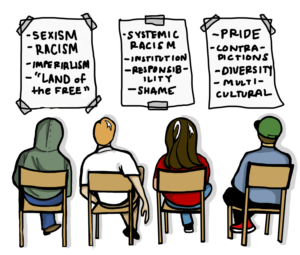 “Lots of my white classmates, while nominally progressive and ardently against overt discrimination, tended to tokenize the people of color in their lives [and] ask the students of color in the class to speak for their race, or tell students of color who criticized racist institutions to do something about it,” Carvill said. Carvill is now teaching environmental studies classes with focuses on humanities and policy at UCSC. She said she feels she will construct her classes and reading selections with the workshop in mind. Lakia “Kia” Queen also urged students to reach out to each other and get to know each other’s stories. Awareness is about connection, she said, and forming deeper relationships with people with different backgrounds and views helps to see the whole picture.